Folks at Xamarin finally decided that in order to make Xamarin Certification more attractive and accessible, they needed to reform the enrollment strategy. So they announced monthly subscription. They spread out the $999/year cost to monthly enrollment of $83.25 ($999/12 – paid monthly). So, how does that help you ask? Good, read on. For starters, it might make it easier for developers on the edge to finally make a decision. If you are trying to save money and still get certified, you can get enrolled and take all the courses in the certification track which may take 3 to 4 months to complete. After that, you can take the exam and get certified. Your cost of certification just went down from $999 to however many months it took you times $83.25. If your employer allows, you might also be able to expense this monthly fee as education expense. For folks trying to keep their certification active, the monthly plan will help in taking required classes and end your enrollment if you do not want to take advantage of all the other topic covered by Xamarin experts. What’s this thing I hear about Azure subscription? If you have Azure subscription, you will be able to pay for Xamarin University with it. Unfortunately though, if you have MSDN license, you may get some credit for Azure subscriptions (I think it’s $150 depending on your subscription level). You will NOT be able to use that credit to pay for our monthly fees. A Microsoft account, such as, an outlook.com or hotmail.com address, or a work or school account, such as someone@fabrikam.com. A Microsoft Azure subscription to use for billing. There is no cost to create an Azure subscription, which essentially is a billing account that gets charged when you buy something.You may already have an Azure subscription if you use Azure, or you pay for Visual Studio Team Services or other services through Visual Studio Marketplace. If you don’t have an Azure subscription, you can sign up for Azure before or during your first Marketplace purchase. Learn more about using Azure subscriptions to bill Marketplace purchases. For complete instructions on how to buy, manage, or cancel Xamarin subscription using Azure subscription, checkout VisualStudio – Buy Xamarin University. That’s it. 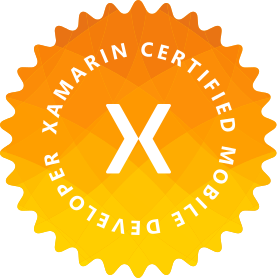 Now you can get Xamarin certified for less. Good luck. Xamarin announcement can be found here.